I can't pretend to deny that my entire family has been counting the days until a certain movie premieres in the U.S. – a movie involving a green-eyed, bespectacled young wizard with that irresistible British accent. Come to think of it, the entire cast speaks that way. Ahhhh. But I digress. Robert and I have read all seven Harry Potter books out loud to our kids – twice. And yet our devotion pales in comparison to many people we know, who have read them even more times – one friend is re-reading the entire series, this time in the colloquial British version. I'm guessing some of you have, and some of you have not, read the Harry Potter books, but since we all love the violin, I wanted to note that in many, many instances throughout this book, one could replace "music" for "magic." Moreover, the whole world of "wandlore," with wandmakers, shops, the choice of a wand – is so much like lutherie, I found myself wondering if author J.K. Rowling had ever visited a violin shop or talked to violinists about their instruments. For example, when Harry gets his wand at "Ollivander's – Maker of Fine Wands." Ollivander, a total wand wonk, absolutely reminds me of certain luthiers, who are full of the knowledge of their craft, and of their customers' preferences. "Yes, yes. I thought I'd be seeing you soon. Harry Potter." It wasn't a question. "You have your mother's eyes. It seems only yesterday she was in here herself, buying her first wand. Ten and quarter inches long, swishy, made of willow. Nice wand for charm work." "Your father on the other hand, favored a mahogany wand. Eleven inches. Pliable. A little more power and excellent for transfiguration. Well, I say you father favored it – it's really the want that chooses the wizard, of course." Harry is clearly intimidated by the hundreds of wands in the store, and by their mystique. I was reminded of being a college student, looking for a bow at Bein and Fushi. My musical Muggle parents were not present, and it was up to me to decide. Suddenly I felt like I didn't actually know how to use a bow, or how to play the violin, because I didn't actually know how to choose a bow. "Well now – Mr. Potter. Let me see." He pulled a long tape measure with silver markings out of his pocket. "Which is your wand arm?" "Er – well, I'm right-handed," said Harry. "Hold out your arm. That's it." He measured Harry from shoulder to finger, then wrist to elbow, shoulder to floor, kneed to armpit and round his head. As he measured, he said, "Every Ollivander wand has a core of a powerful magical substance, Mr. Potter. We use unicorn hairs, phoenix tail feathers, and the heartstrings of dragons. No two Ollivander wands are the same, just as no two unicorns, dragons, or phoenixes are quite the same. And of course, you will never get such good results with another wizard's wand." They try wand after wand, dutifully searching for the one that will best enable magic to flow from Harry's fingers. "Tricky customer, eh? Not to worry, we'll find the perfect match here somewhere – I wonder, now, – yes, why not – unusual combination – holly and phoenix feather, eleven inches, nice and supple." Harry took the wand. He felt a sudden warmth in his fingers. He raised the wand above his head, brought it swishing down through the dusty air and a stream of red and gold sparks shot from the end like a firework, throwing dancing spots of light on to the walls.... Mr. Ollivander cried, "Oh, bravo! Yes, indeed, oh very good. Well, well, well...how curious...how very curious..."
Now, I certainly didn't find my perfect bow, or my perfect violin, the first time I tried. It was a greatly attenuated process, but this description sounds exactly like how it felt when I found the right violin – how it felt immediately familiar, how I felt like the violin itself was making requests of me. Still, many violins do have connections to other musicians, and this is another aspect mirrored in the Harry Potter wand world. Just like the ghost of Jaqueline du Pre seemed to hover with Yo Yo Ma when he first played the Elgar on the cello that was once hers (see Stradivari's Genius), a wand in Rowling's magical world also will retain the last spells it has performed, and under special circumstances, reveal them, a phenomenon called "Priori Incantatem." And how about the mystical "Elder Wand"? Is this perhaps a bit like our Messiah or Il Cannone in the violin world? Is studying this wand a little like trying to uncover the secrets of Stradivari and replicate them? "You really think this wand exists, then, Mr. Ollivander?" asked Hermione. "Oh yes," said Ollivander. 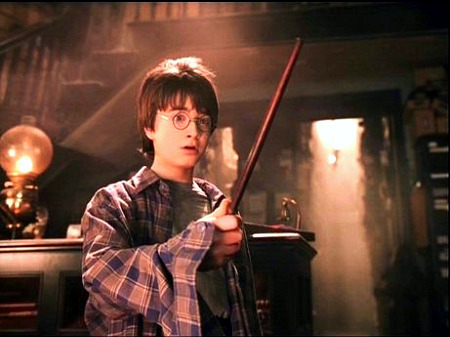 "Yes, it is perfectly possible to trace the wand's course through history. There are gaps, of course, and long ones, where it vanishes from view, temporarily lost or hidden; but always it resurfaces. It has certain identifying characteristics that those who are learned in wandlore recognize. There are written accounts, some of them obscure, that I and other wandmakers have made it our business to study. They have the ring of authenticity." "It was a rumor..." whispered Ollivander. "I believe Gregorovitch himself started it. You can see how good it would be for business: that he was studying and duplicating the qualities of the Elder Wand!" Hmmm, looks as though wandmakers are as competitive and back-biting as... oh never mind! Funny you should mention this. Just a little over a week ago I was on a search for a bow. The violin I got is a wonderful instrument. The bow that came with ... well ... not so much. As I was trying out different bows, my friend and I commented to each other how finding a bow was a lot like finding a wand. We laughed at that, but the comparison never really quite left me. When I did find the right bow, I knew it the moment I picked it up. I didn't know what I was looking for exactly, but I knew I'd know it when I found it. Did I mention that my bow was haired with Pegasus tail? Helps fly through the fast passages. Great article. Have thought about this a few times as the local violin shop (Stringers of Edinburgh) is very like Olivanders in the book. I'm convinced that it's magical because whenever I go in there, I wind up spending more money, even when I hadn't meant to. J K Rowling lives a wee bit down the road so, when I had been in there for a violin, I thought that she may have based aspects of it on Stringers if her daughter had been into music at school. Oh, and Edinburgh does have a (k)night bus.... That seems to go really quite fast.... However the last time I looked it didn't have a shrunken head on the rear view mirror. Wow, I thought the same thing when I was reading those books.... how certain wands just "fit" a wizard well.... didn't know lots of others thought the same. That's iiiiinteresting how Ollivander's really does resemble a local violin shop--so maybe there really is something to this. That was well-written Laurie. I'm hoping to get a Tubbs one day. I wonder what the wizardly equivalent is? Being half English I was very insulted when I found out they had changed the books for the American audience. We have 2 sets: the American versions in hardback and the British versions in paperback. I recently finished rereading the British versions in preperation for the movie on Wednesday. Friday we started rewatching the movies on DVD. One a day, watching movie 5 the day before movie 6 comes out in the theaters. We are not going to the midnight showing, DS is afraid he'd fall asleep half way through. I do see the similarities between wands and bows/violins. I'm trying to understand why there would be an American version of HP? How on earth does it differ from the "British" version? It seems that they dumb it down for us Americans. They change the spellings to the American ones, and change British terms and colloquialisms to make it more understandable to the Yank cousins. For example, the title "Harry Potter and the Philosopher's Stone", was changed to "Harry Potter and the Sorcerer's Stone" in the American Edition, because they thought those of us across the big pond wouldn't know what the Philosopher's Stone was (grrrrrrrr). I found out few years ago that they did this with some other authors I was reading. I was FURIOUS when I discovered this bait and switch. From that point forward, I would order my books by British authors only from British sources ... amazon.co.uk is a great one. I haven't read a British author in an American edition since. When I read the Harry Potter books, they were British editions. Frankly, I find this practice disrespectful to the author and insulting to the reader. But I don't think its likely to change anytime soon. Steven is exactly correct. They change the vocabulary used. Having spent 6 summers (2-3 months each) in England growing up I have no trouble with the vocabulary. I change my vocabulary when I'm in England and I have been known to pick up the accent just by watching a British movie or speaking to someone with a British accent (I really had to watch the last one when I was working at a 4 diamond inn and we had British visitors, I didn't want them to think I was making fun of them). I recently found out that the author of Charlie Bone is British and am now thinking of getting the British versions of those. I think I need to do what you do and make sure I know where the author is from before buying a version of a book. My son is currently reading the HP books and he chose to read the British versions. I told him to let me know if he had trouble understanding the meaning of a word. He' on book 4 and hasn't asked yet. We read them twice for our children, too -- once in Dutch, and once in English. I will certainly get my 13 years old daughter to read your blog. She is the violinist, and a Harry Potter enthusiast. She read the first six books in French, her mother tongue, got the seventh in English, and then re-read the whole series time and again in English, in the British version that we have here in Canada. It was so much more fun reading the original version, all sparkling with that British flavor - although a bit harder for her: they were her first large books in English, and in that British English that is not at all familiar to us in Canada either, but she really enjoyed it. I guess I succeeded in communicating her my taste for reading books in their original language: so much of the genius of an author, so much flavor is lost in the translation process. Traduttore, traditore, as the Italians say. (Translator, traitor). Your observation about the similarity between bow and wand lore is the most interesting thing I have heard or read about the Harry Potter books in years. I really enjoyed the article.